Bright pink with pink fringe, this bags says LOVE all over it!! 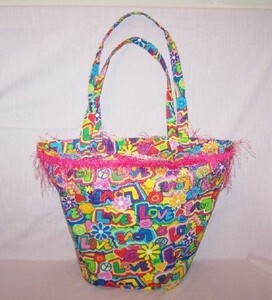 All the colors are on this bag in hearts and flowers also. Some of the colors are gold, yellow, bright green, purple, blue, pink and red. There is also sparkles outlining them too. Made of canvas this tote bag is washable It has a small pocket on each side on the inside and is lined. The straps are a little longer so you can drape it over your shoulder. Size 12" high x 17" wide at the very top and a 4" base.